“The Lonesome West” is getting a scaldingly focused production at the Keegan Theatre near Dupont Circle, directed with keen respect for the language of the play, which is punctuated by grunts and noises, by Mark A. Rhea. “The Lonesome West” is an actor’s dream for all concerned, although for the audience there’s also a helpful glossary of terms and references which includes, oddly enough, mentions of two popular American television shows of the 1990s, but also a definition and pronunciation guide to the local vernacular. 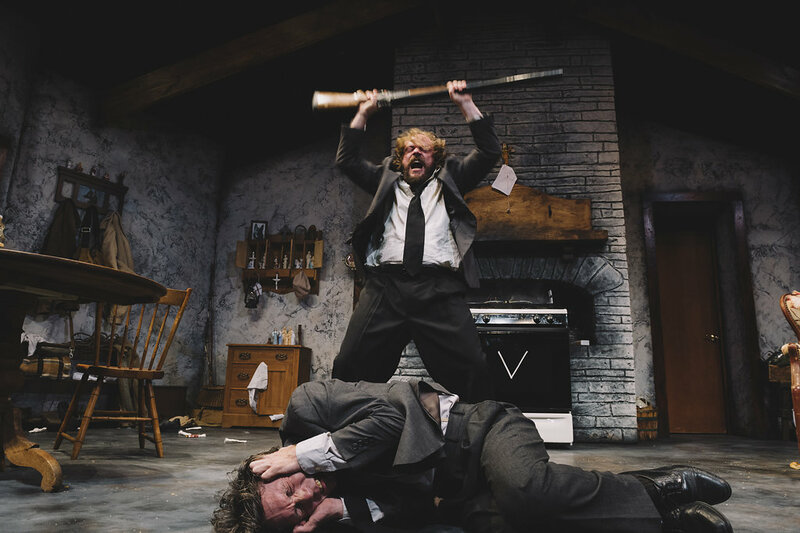 Matthew Keenan as Coleman has a lewd, aggravating, almost gleeful way about him; he’s one for shock and awe, leaving no insult unsaid, no provocation left unprovoked, no dirt left unstirred, no statue untouched. Bradley Foster Smith is more curled up and inward. Outwardly tense as Valene, he’s a nerve ending wearing clothes, and a provocateur as he doles out poteen by the half-inch to the priest and to his brother. By contrast, Chris Stezin as the painfully bewildered and deeply sinking Father Welsh seems to inhabit his vestments as if they were torn from a wailing wall. Sarah Chapin as Girleen, blunt, sometimes cruel, but always vivacious, sounds almost like a discordant life force — discordant because it seems that in this town, where people die mysteriously and violently or walk into the ocean, even the worms might have teeth, and bare them. Watching this, you’re at turns repelled, entertained — in the manner of being in a coliseum the size of a living room — bewildered and aggrieved and shocked. Like being on a street corner during the course of a hit and run, you can’t look away.